Pedrosa Fourth in Crash-Strewn French Grand Prix – Dani Pedrosa (Repsol Honda RC213V) was the top Honda finisher in an incident-packed French Grand Prix at Le Mans today – a race in which team-mate and erstwhile championship leader Marc Marquez (Repsol Honda RC213V) crashed while battling up front, remounting to finish 13th. 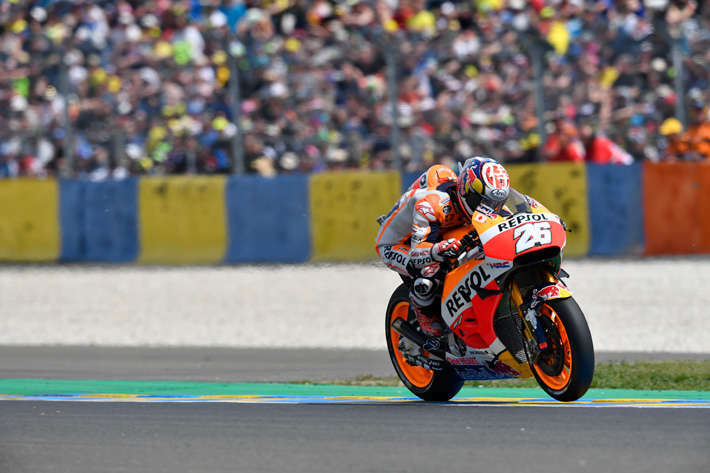 Marquez was one of eight MotoGP riders out of 21 starters to crash at Le Mans’ Bugatti circuit and the only one able to get back on board and finish the race. The fifth of 18 rounds, run in front of a record crowd of 99,000, covered 28 laps of the tortuous 4.185-km stop-and-go circuit, and brought a second win of the year to Jorge Lorenzo (Yamaha), with team-mate Valentino Rossi second. The victory handed Lorenzo a five-point lead in the championship over Marquez, who remains the only one of the top-five to score in every race. This was the first time this year that the former 125, Moto2 and double-MotoGP champion did not finish on the top-three podium; his 2017 record including two race wins in Argentina and Texas. Pedrosa had qualified only eighth after he slipped off during qualifying, but the experienced campaigner – in his 11th year in the factory Honda team – made no mistakes in the race, moving steadily forward to finish just over 4.5 seconds behind third-placed Maverick Vinales (Suzuki). The former 125 and double 250 World Champion sustained his fourth position in the championship, while still adapting to the major technical changes of the 2016 season: Michelin tires and control electronics. Marquez had started from the front row, and was disputing second place with Ducati’s Andrea Dovizioso when both slipped off at the same corner, independently but in close formation. Marquez scrambled back and managed to restart, finishing a lap down but still able to gain three potentially valuable points. The three satellite-team riders also paid the price of treacherous grip levels. Cal Crutchlow (LCR Honda RC213V) and team-mates Tito Rabat and Jack Miller (EG 0,0 Marc VDS Honda RC213V) all fell and were unable to restart. For Rabat, the only rookie in the MotoGP class, it was the first time he has not made the checkered flag. In the Honda-powered Moto2 class, Alex Rins (Paginas Amarillas HP 40 Kalex) took a second win of the season and took over the championship lead, stretching away from Simone Corsi (Speed Up Speed Up) to win by 1.802 seconds. Moto2 pole qualifier Thomas Luthi (Garage Plus Interwetten Kalex) led for the first six of 26 laps, while Rins moved through from third on the first lap to take up the pursuit. Two laps later Corsi followed him past Luthi, with Lorenzo Baldassarri (Forward Team Kalex) completing a four-strong group gradually moving clear. Baldassari also got ahead of Luthi, and the pair lost touch as they scrapped over third. When Baldassari slipped off on lap 22, Luthi was assured of of a podium finish, almost three seconds behind Corsi. Franco Morbidelli (Estrella Galicia 0.0 Marc VDS Kalex) lost touch with the leaders after a strong start, finishing a lone fourth, seven tenths ahead clear of Takaaki Nakagami (Idemitsu Honda Team Asia Kalex). Erstwhile championship leader Sam Lowes (Federal Oil Gresini Moto2 Kalex) was also closing at the end, with the Jerez winner and former Supersport World Champion just eight tenths behind Nakagami in sixth. It was enough to retain second overall, five points behind new leader Rins, and 13 ahead of Luthi. Axel Pons (AGR Team Kalex) came through to equal his career-best finish in seventh, passing Hafizh Syahrin (Petronas Raceline Malaysia Kalex) with two laps to go. Class rookie Miguel Oliveira (Leopard Racing Kalex) was ninth, his best finish so far, with Luis Salom (SAG Team Kalex) completing the top ten. Defending champion Johann Zarco (Ajo Motorsport Kalex) had a deeply disappointing home GP. He qualified fourth and was circulating in eighth place at the head of a big pack when he crashed out unhurt. In Moto3, Jorge Navarro (Estrella Galicia 0,0 Honda NSF250RW) took his third podium finish of the season, with a hard-fought third place, ahead of his fast rookie team-mate Aron Canet (Estrella Galicia 0,0 Honda NSF250RW), and inches behind the KTMs of winner Brad Binder and Romano Fenati. The quartet had been trading blows all race long, and Navarro finished within four tenths of a second of the leader. Canet was less than a second behind, after a last-corner lunge ended with him running slightly wide. It was a career best result for the Grand Prix rookie, after an impressive seventh at round three in Texas. There were sic Honda riders in the points, with pole qualifier and Qatar GP winner Niccolo Antonelli (Ongetta-Rivacold Honda NSF250RW) eighth after leading off the line; just over a second ahead of Jakub Kornfeil (Drive M7 SIC Racing Team Honda NSF250RW). The Czech rider had been with the lead group, and fought back to ninth after taking to the escape road at high speed in the early stages of the 24-lap race. Livio Loi (RW Racing GP Honda NSF250RW) was 11th and Argentine GP winner Khairul Idham Pawi (Honda Team Asia Honda NSF250RW) was 14th. Navarro retained second overall in the championship; Antonelli moved up to fifth; while Pawi moved equal on points but ahead on individual race results to Enea Bastianini (Gresini Racing Moto3 Honda NSF250RW), who was ruled out of the race on Thursday after suffering a wrist fracture in a training accident. The next round is the Italian GP at Mugello in two weeks, on May 22.